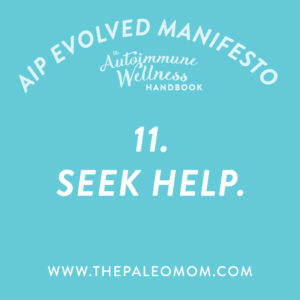 My good friends Mickey and Angie at autoimmune-Paleo.com have created what they call AIP Evolved – A Manifesto, a collection of 20 key concepts that are fundamental for a successful healing journey for those of us with autoimmune disease. 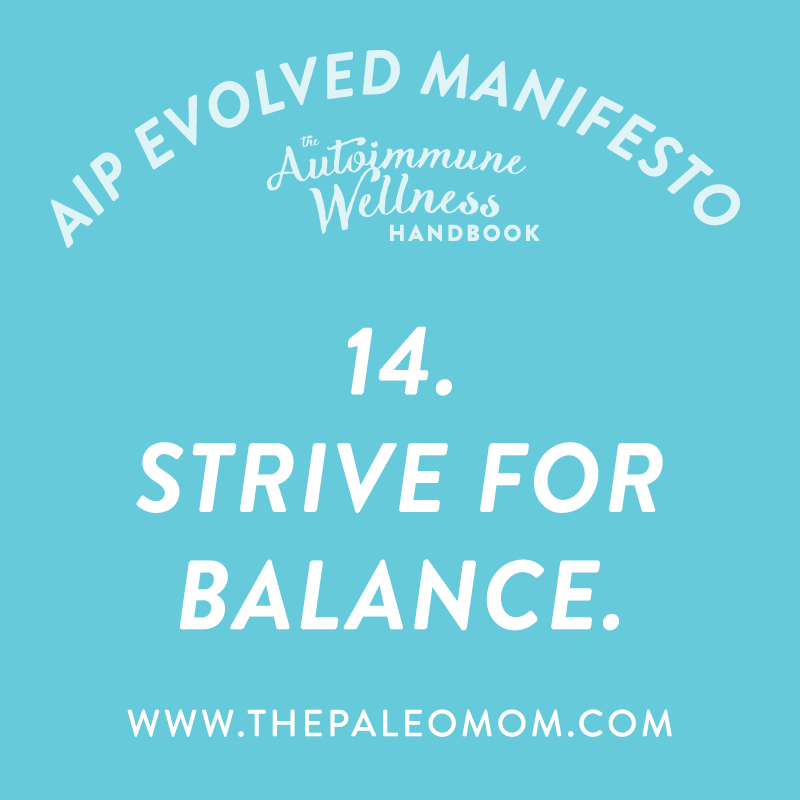 I was blown away the first time I read through the AIP Manifesto, a phenomenal distillation of tenets beyond the basic rules of the Autoimmune Protocol that encompasses positive attitude, approach to medical professionals, troubleshooting, balance, and making this healing lifestyle sustainable for long-term health. It also dispels some important myths floating about out there, like the only way to be successful is by paying thousands of dollars for the guidance of a healthcare professional or expensive supplement regimes. You don’t, but we’ll get to that. 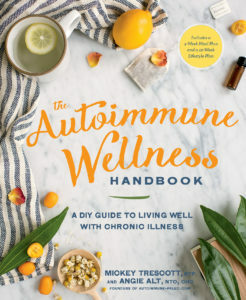 The Manifesto, in many ways, guided the overall structure of Mickey and Angie’s new AMAZING book, The Autoimmune Wellness Handbook — A DIY Guide to Living Well with Chronic Illness. If you are an autoimmune sufferer, this is a must-have book! 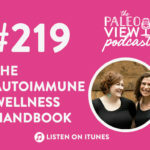 It’s a comprehensive guidebook to living healthfully with autoimmune disease, brimming with compassion and understanding while being jam-packed with information, tools, and inspiration. 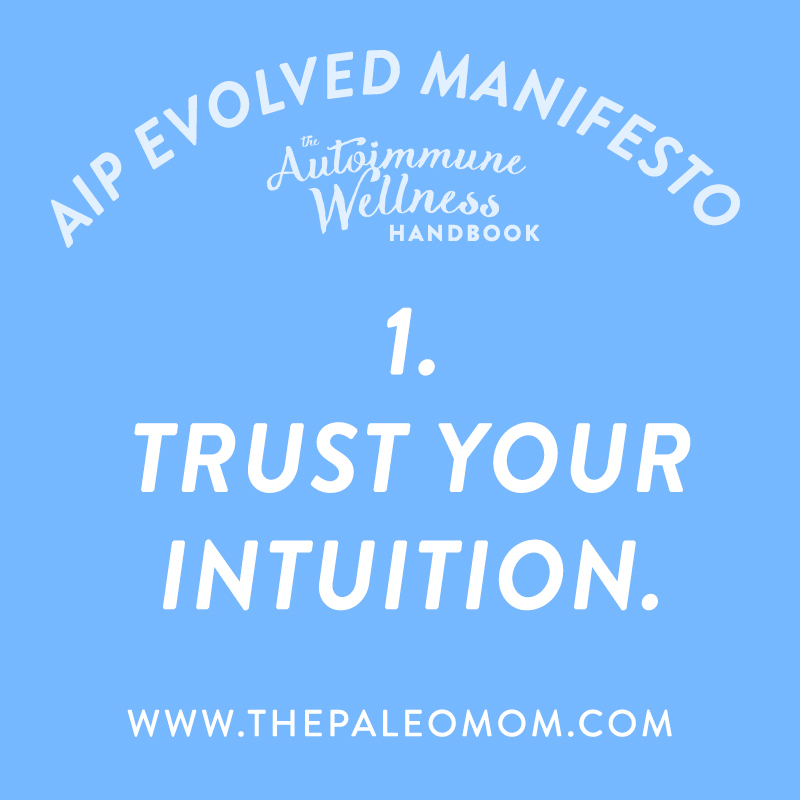 The Autoimmune Wellness Handbook is a guide not just to the autoimmune protocol, including both diet and lifestyle aspects, but to being the expert on your own body so that YOU are in charge of your health journey. 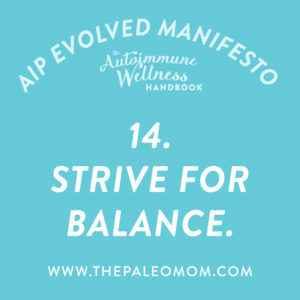 With its focus on mindset, balance, sustainability, kind and gentle transitions, testing, troubleshooting, and finding the right healthcare practitioners to work with, not to mention some amazing recipes, a 4-week meal plan and a 12-week lifestyle plan, this book is an essential companion to the resources that I’ve created for the autoimmune protocol, The Paleo Approach, The Paleo Approach Cookbook, and The Healing Kitchen. 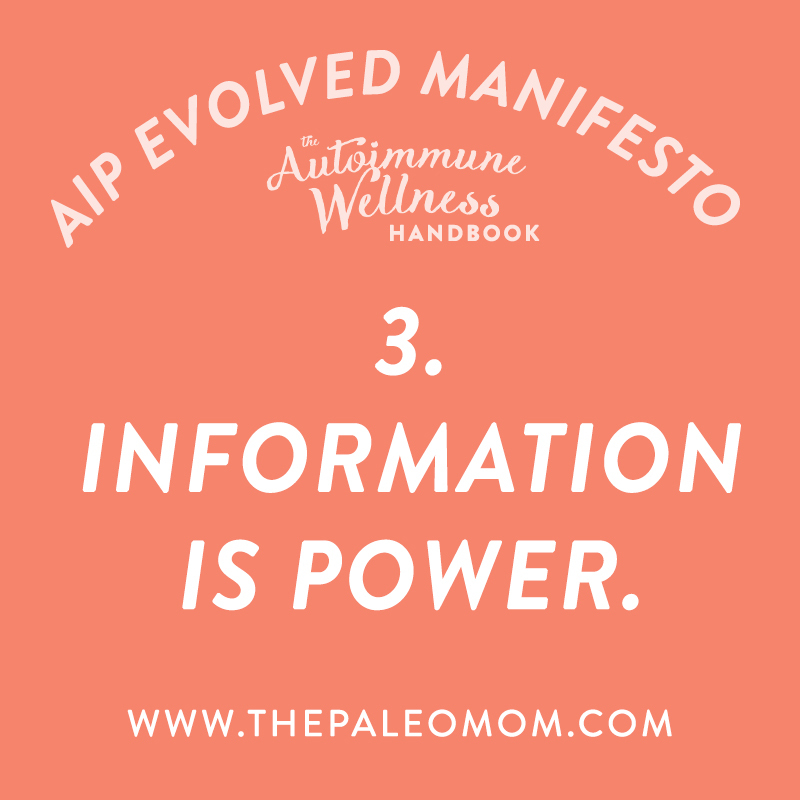 I am sharing Mickey and Angie’s AIP Manifesto here with their permission because I think there are so many important messages contained within. 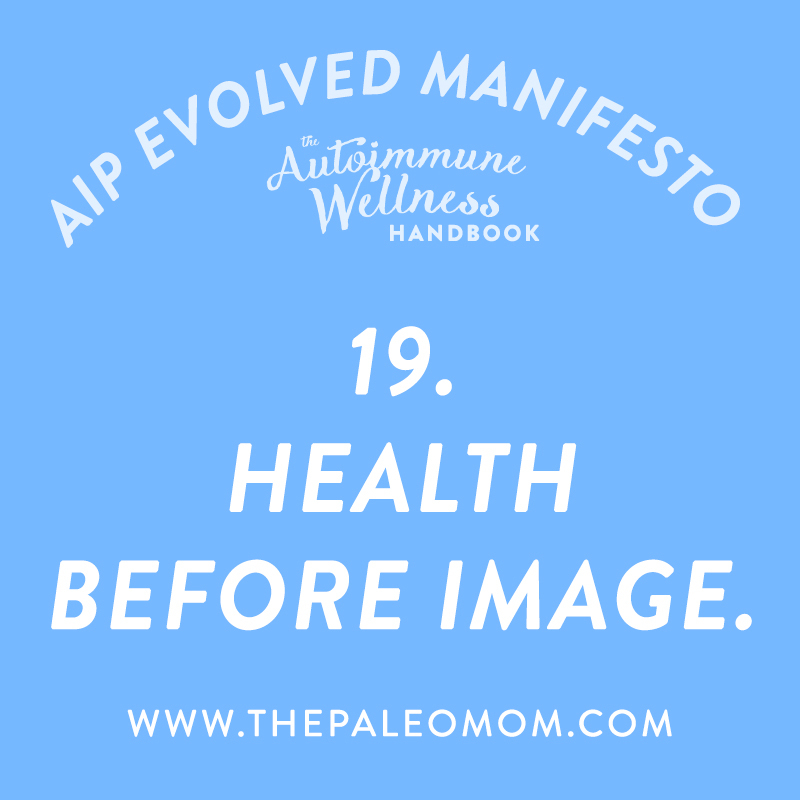 I’ve also added my own commentary to expand on these various concepts with my experience, both personal and from connecting with tens of thousands of people using the Autoimmune Protocol to mitigate chronic illness through live events and social media. You don’t need a guru to navigate this process successfully. This is the heart of the Autoimmune Protocol. You are the expert on your own body. You know how it feels to be inside your skin and, through your healing journey experiences, you are the only one who completely understands how your body reacts to various foods, lifestyle factors, supplements and medications. And while there’s often room for tinkering with the guidance of a functional or integrative medicine specialist, you can achieve great success without paying through the teeth for the guidance of a guru who claims they can cure your disease (for the low, low price of…). 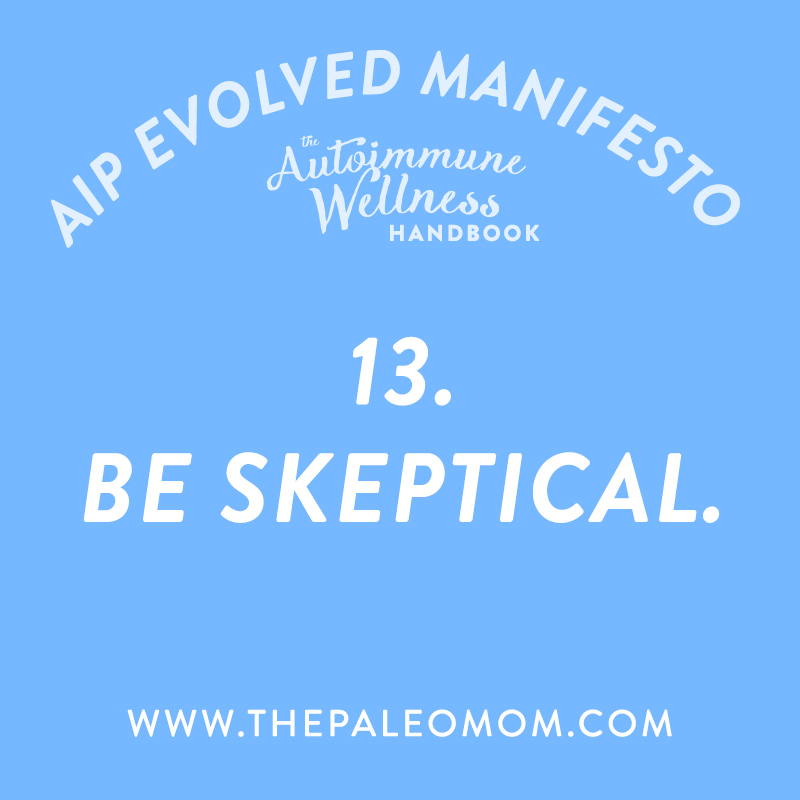 Approach with skepticism any advice, service, treatment, medication, supplement, or propaganda that goes against your instincts, and research your options carefully. 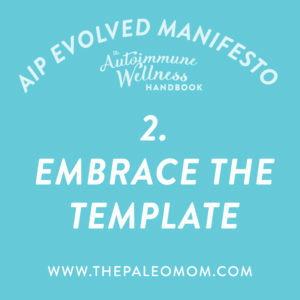 The Autoimmune Protocol is not one-size-fits-all; it’s a template that promotes individuality and self-discovery. 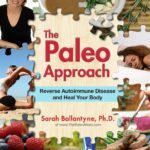 The Autoimmune Protocol is based on the insight gleaned from hundreds of scientific papers and has been validated in a clinical trial as effective in controlling pain and reversing some symptoms of multiple sclerosis (see The First Clinical Trial Using a Paleo Diet for Autoimmune Disease). There’s also a trial under works using the autoimmune protocol therapeutically for rheumatoid arthritis (see here). Not to mention now hundreds of thousands of anecdotal success stories to share! 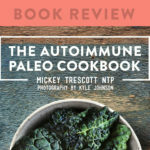 But, at it’s heart, the autoimmune protocol is a sophisticated elimination diet where the foods that are avoided are the most likely culprits behind inflammation and immune dysregulation, identified based on scientific studies that help us understand which compounds in foods promote health versus those that undermine it. But, a variety of factors are at play here, such as genetics, environmental toxin exposures, infection, stress, and sleep. 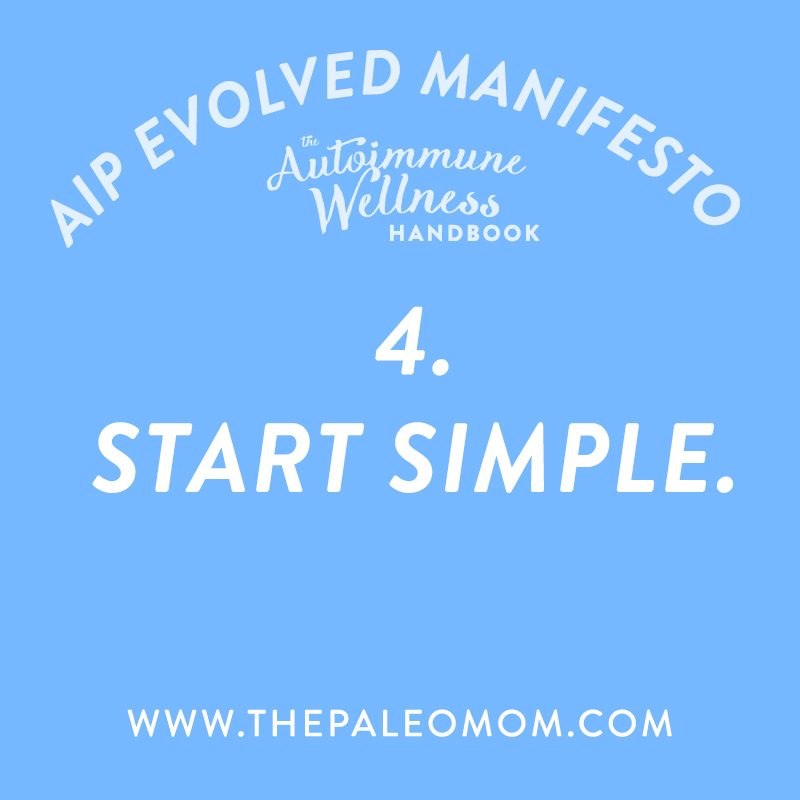 There’s a great deal of individuality when it comes to tolerance to specific foods, which is why the autoimmune protocol is composed of both an elimination phase and a reintroduction phase (see The Reintroduction Quick-Start Guide: A New FREE download!). 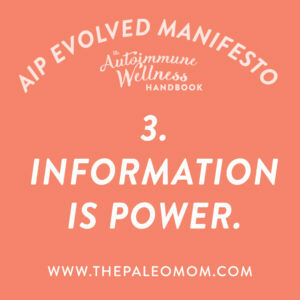 Learn enough to be an informed and proactive advocate for your health. 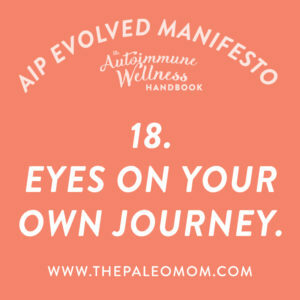 Understanding your disease, the reasons for each element of the Autoimmune Protocol (explained in immense detail in The Paleo Approach, which remains the definitive guidebook for understanding the tenets of the AIP), alternative health treatment options as well as conventional medicine treatment options is key for navigating your health journey successfully. This information helps you make choices (from day-to-day “what to eat”-type choices as well as choices regarding medical procedures, testing, medications, supplements and even exercise regimes). And having this base knowledge is what allows you to have a detailed, productive conversation with any healthcare professionals while maintaining your status as the expert on your own health and body (yay for Key #1!). Begin with the foundations of diet, sleep, stress-management, movement, and relationships before delving deeper. There’s always the desire to get instant results, and with that comes the temptation to try All The Things all at once. 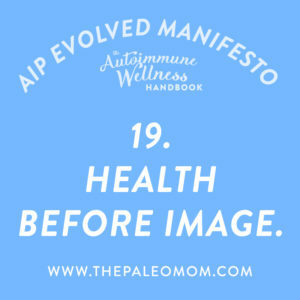 But, just like developing autoimmune disease doesn’t happen overnight, neither does healing from it. Give the basic tenets of the Autoimmune Protocol a chance to be effective before giving up, troubleshooting, adding additional treatment elements, further refining diet, or investing in expensive supplement options. Also, when you change too many variables at once, it’s hard to know which ones are helping and which ones are holding your healing back. Since the goal is to get to a place where you’re experiencing great health with diet, lifestyle and potentially additional therapies that are sustainable over the long-haul, taking things one step at a time is important for both discovery and maintenance. Don’t be afraid to make changes in phases–it was the tortoise and not the hare that won the race! Who said that you have to go all-in all at once? 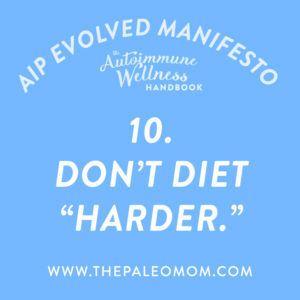 While 30-day challenges abound in the Paleo community, the goal with the Autoimmune Protocol isn’t to lose 10 pounds on time for a wedding, but to discover the optimal food choices and lifestyle choices for your body, then to stick with those to support your best health for the rest of your life! For some of us, the cold turkey approach is extremely helpful. For others, not so much. Respect how you best achieve positive and lasting change in your life. Certainly, severe illness might motivate you to jump in with both feet when you otherwise would have approached transition gradually. But, in the absence of this type of situation, if you stick with new habits better by taking it in baby steps, do that! 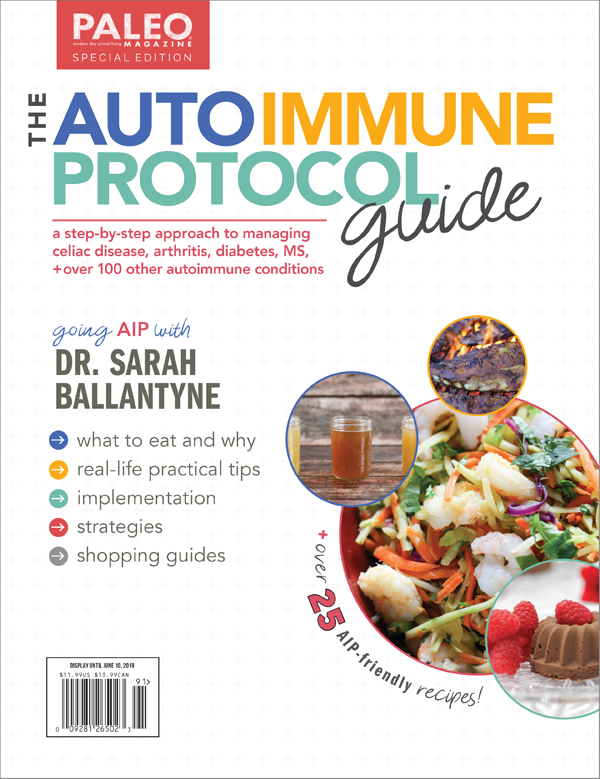 A great program for transitioning to the Autoimmune Protocol successfully yet gradually is SAD to AIP in Six. This is a tremendous resource and thousands have now graduated the program and provided rave reviews! 6. Food is your friend. It provides nourishment to every single cell in your body! Once we start understanding the negative health impact of foods that used to be our staples (like whole grains, soy, and tomatoes), it can be natural to start to distrust foods, feel like there’s nothing safe to eat, or feel like our past food choices are to blame for our current health struggles. At the risk of sounding like a wildly-popular Disney movie, let it go (let it go…). Rather than blaming the foods eliminated on the autoimmune protocol, embrace and celebrate the healing foods you now know to focus on. Appreciate the tremendous healing power of food. Appreciate how these nutrient-dense foods are supplying your body with the resources it needs to heal. You get to still love food, enjoy flavor, experiment with new recipes, and have a positive relationship with this necessity of life. 7. 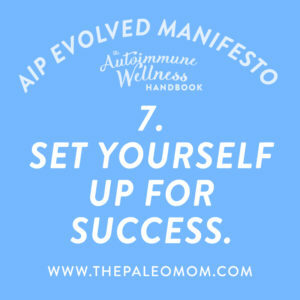 Set yourself up for success. Planning and preparation are the key. 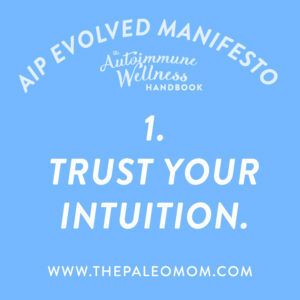 The number one place where people struggle with the Autoimmune Protocol is in planning and preparation. Take the time plan and prepare so you have some pre-cooked meals in your freezer for emergencies, know what you’re going to cook for the week ahead while making sure you have ingredients on hand, have a back-up plan for treats, have homemade or prepackaged portable snack foods, and know how you’re going to handle travel and social events. My absolute favorite resource for meal planning is Real Plans, a tremendously useful and completely customizable online meal planning service. For as little as $6 per month, you can choose your dietary restrictions, budget, favorite approach to cooking, and swap out any recipe for another favorite, then use your interactive shopping list and cooking timeline to make staying on track with delicious food a breeze all week! 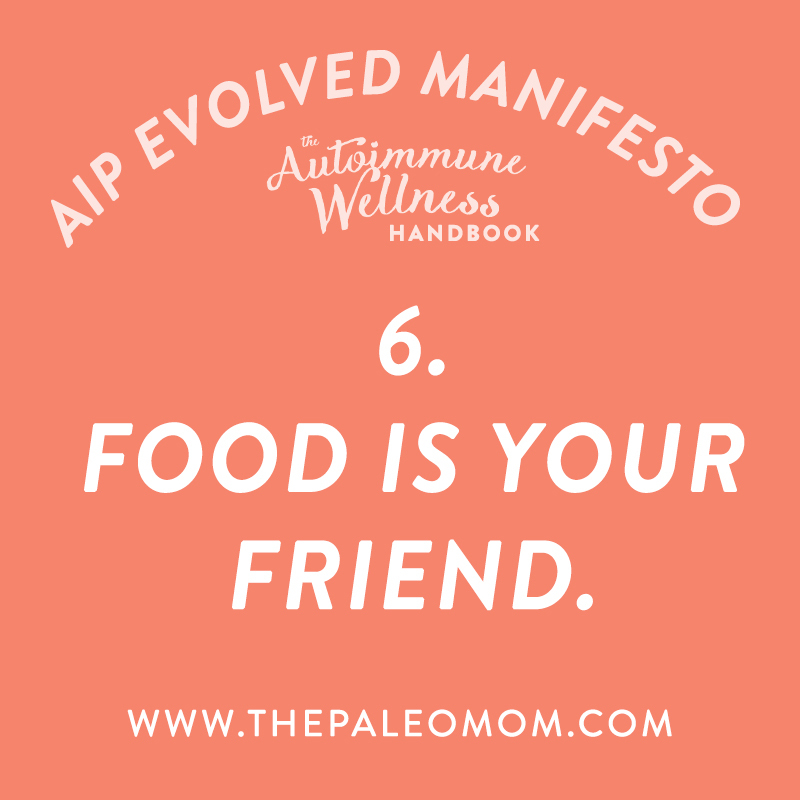 And with recipe add-on packages from myself and Autoimmune-Paleo for only $1 more per month, the collection of 100% AIP recipes is phenomenal! Don’t ignore the foods that accelerate healing and restore health. 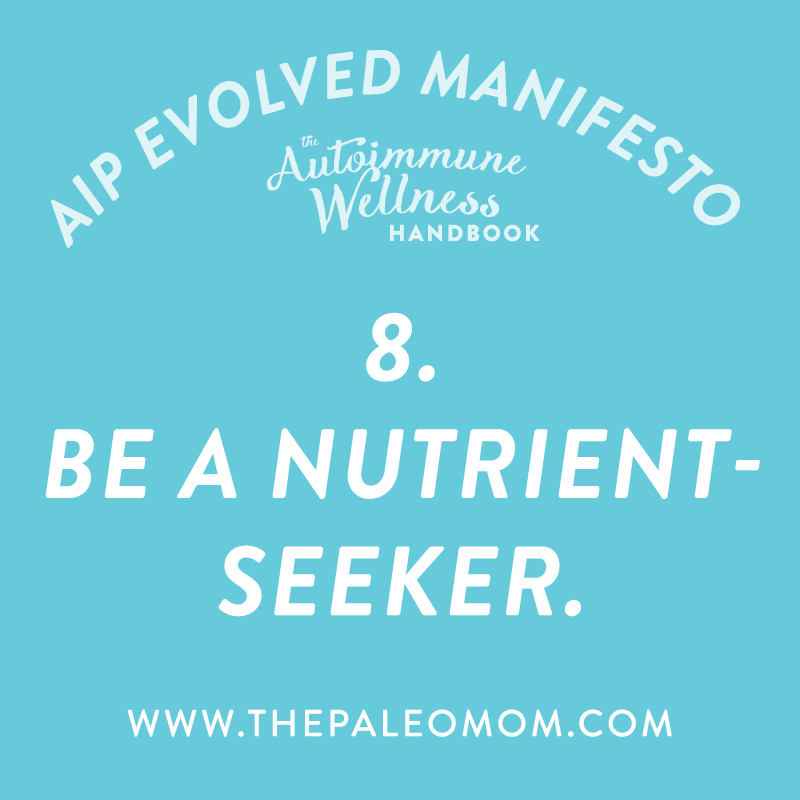 A major tenet of the Autoimmune Protocol is flooding the body with nutrients by incorporating organ meat, seafood, and tons of veggies into our diets (see 3 Ways to Up Your Nutrient Game). I understand how intimidating it can be to prepare and eat new foods, especially ones we’ve long thought of as gross. 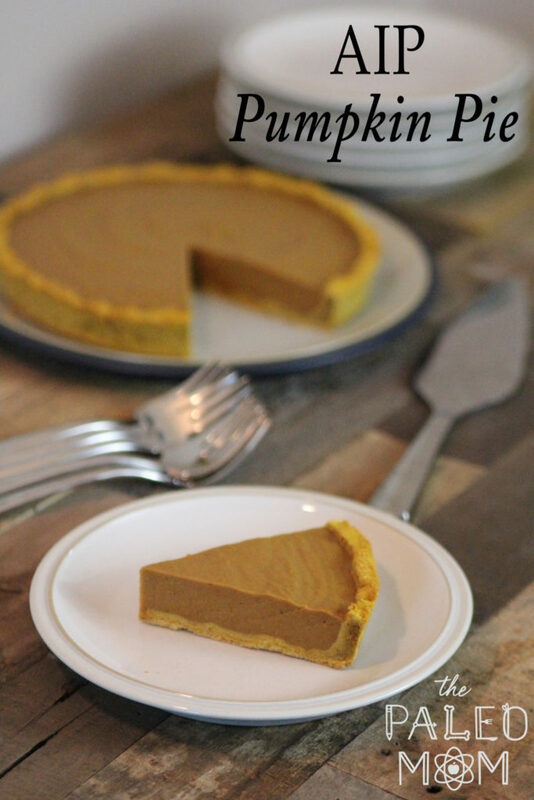 The good news is that there’s lots of different ways to prepare these foods to cater to your palate and a wide range of recipes available from AIP bloggers, cookbooks and Real Plans to make this possible! Nutrients are often synergistic and more potent in nature’s packaging. This goes along with Key #8. 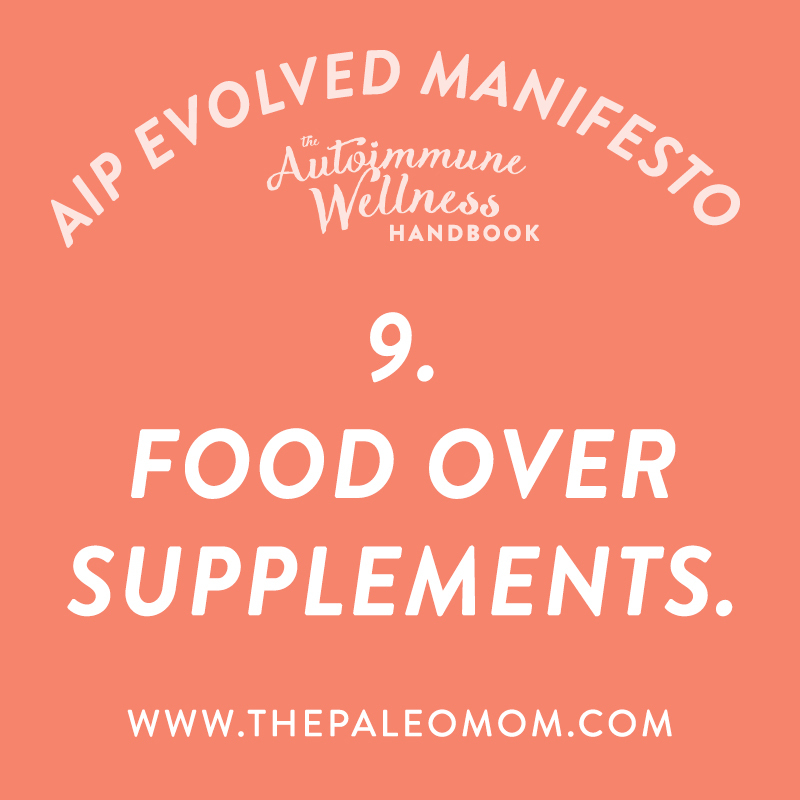 It’s tempting to seek out supplements in lieu of eating foods we’re not used to with the misconception that we’re still providing our bodies with everything they need. Unfortunately, the nutrients in supplements are typically less absorbable and usable by our bodies, lack synergistic elements, and are often packaged with less-than-stellar fillers. And while there are some acceptable options (like encapsulated organ meat), supplements need to be thought of just that: a supplement to an near-perfect diet (rather than a substitute). That doesn’t mean we have to eat liver and onions though, see 3 Painless Ways to “Eat Your Liver”. Resist the temptation to further restrict instead of troubleshooting. 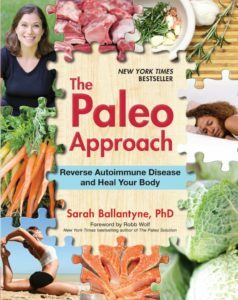 I can’t tell you how many people I’ve met who, with excellent intentions and for the pursuit of an even more healing diet, end up combining the autoimmune protocol with other therapeutic approaches, like GAPS/SCD, low-FODMAP, and the candida diet. And while there is definitely sometime merit to combining aspects of these therapeutic diets, directed by testing and under the supervision of a qualified healthcare professional, for many, it restricts the variety of the diet to the point of losing key benefits, like complete nutrient sufficiency and adequate prebiotic fiber intake to support microbiome health. Yes, for some people a food sensitivity to a normally AIP-compliant food can be the issue, more common culprits are inadequate attention to sleep and stress management. 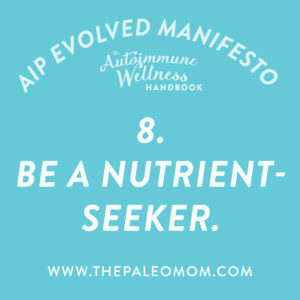 Instead of jumping into additional dietary restrictions, check out Key #12. When necessary, thoughtfully add practitioners to your team who don’t undermine your authority. 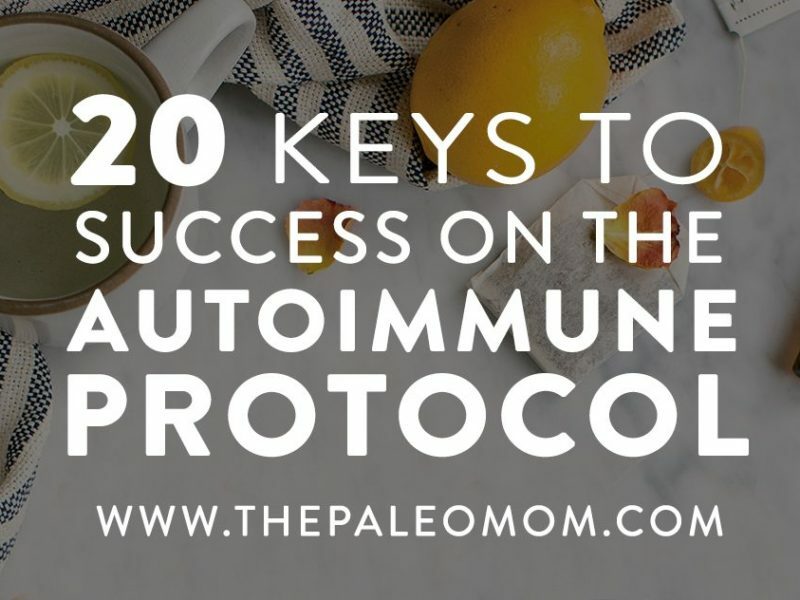 Just because we’re following the Autoimmune Protocol, doesn’t mean we can’t or shouldn’t take advantage of modern medicine, the expertise of healthcare professionals, or seek out additional treatments to add to our own individualized protocols. 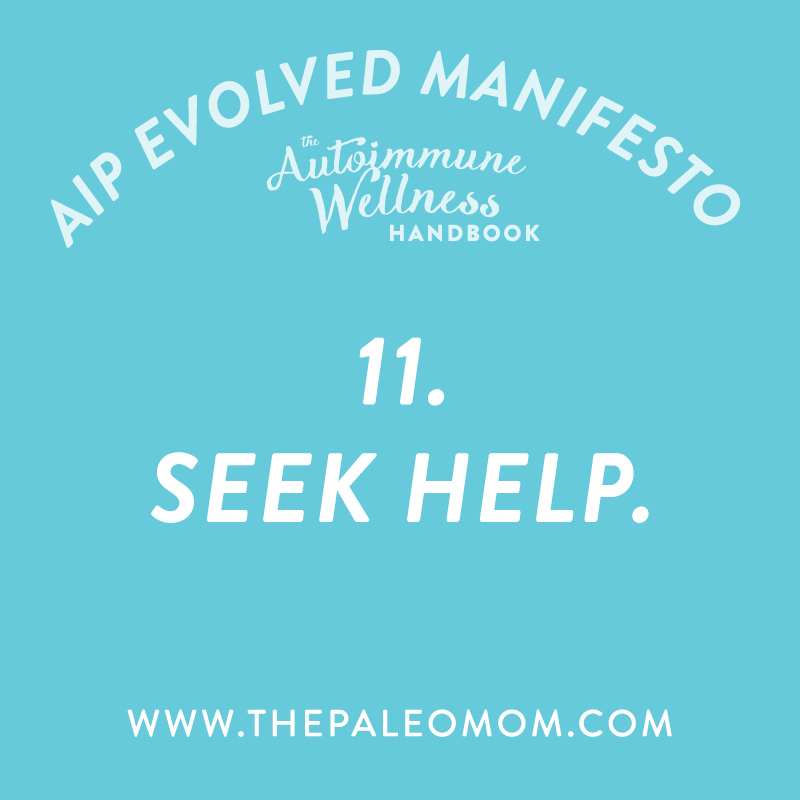 The Autoimmune Wellness Handbook has included an entire section on the different types of practitioners that you might want to add to your team, their expertise, and what to look for. In my own search for healthcare practitioners to work with, I meet/interview them before committing to work with them, to make sure that we have synergistic approaches to health as well as mutual respect and a rapport. Here’s a good place to emphasize that medication is not failure. 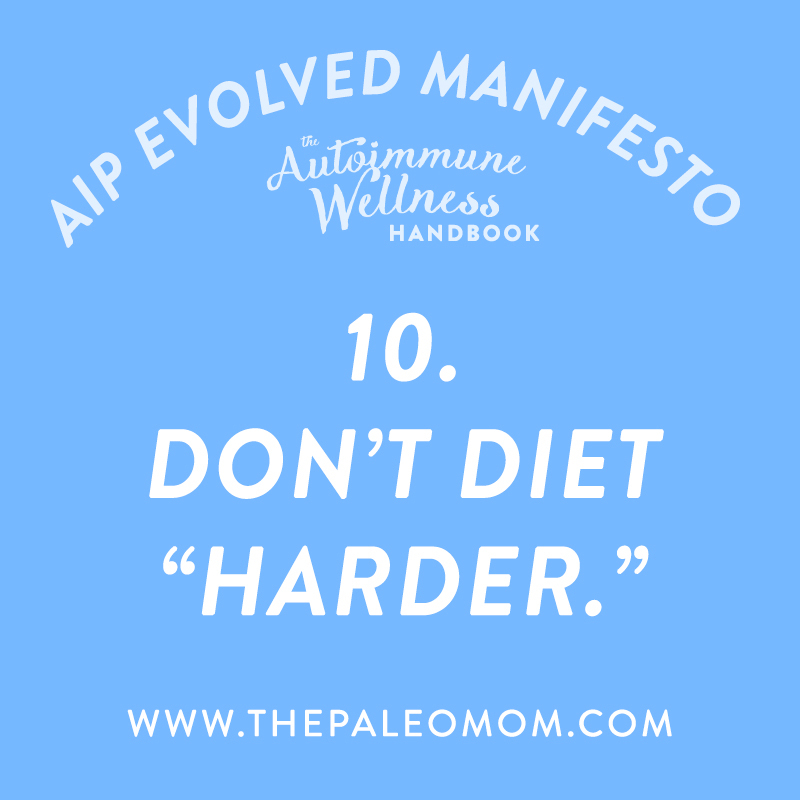 The need for medication does not mean you didn’t “AIP hard enough”. We get to use the best of both worlds, supporting our bodies with diet and lifestyle while taking advantage of tools and medications that are chosen with thought, deliberation, and an understanding of pros and cons. Always use testing to reveal root issues, if progress is not as expected. Too often, troubleshooting begins and ends with a symptom checklist. 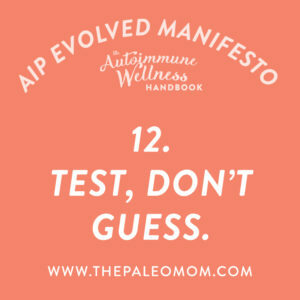 Whether you’re working with a practitioner who diagnoses based on symptoms alone (unfortunately too common for adrenal fatigue, food sensitivities, certain infections, candida and SIBO, yet each of these things needs testing to be able to cater protocols successfully) or you’re using Dr. Google to self-diagnose, this can lead us down some very dangerous paths. This doesn’t mean symptoms (or The Google) are irrelevant, but that testing must be done to verify the presence of these confounding factors as well as to properly design treatment. Everybody’s situation is different, even within the context of the same disease, and even among family members with the same disease. Resist the temptation to use the same protocol as a friend or family member because your symptoms looks the same. 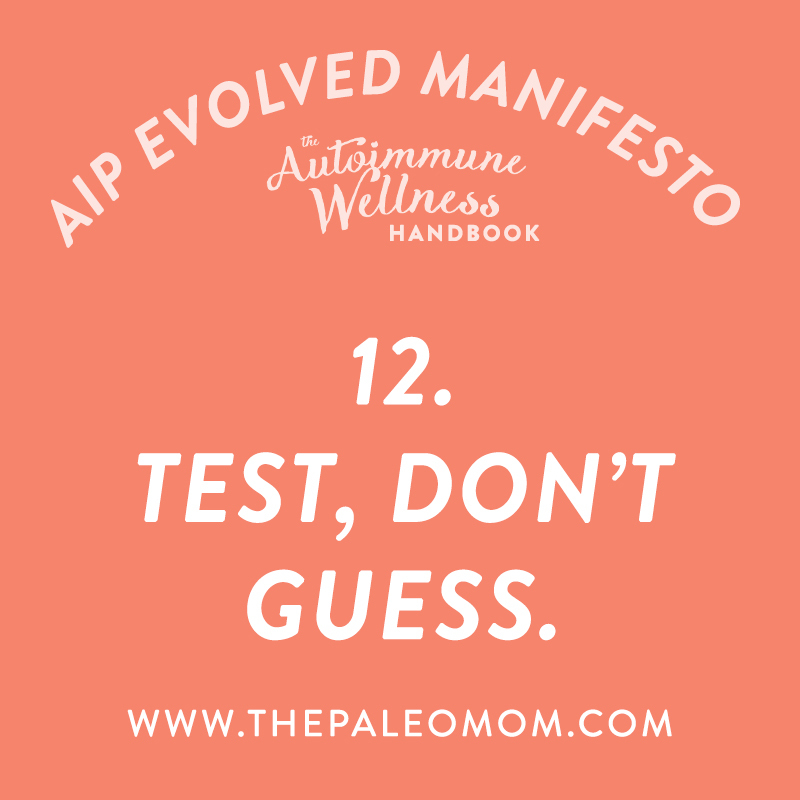 And, seek out functional or integrative medicine practitioners who thoroughly understand appropriate testing and procedures for successful troubleshooting (that’s Key #11!). “Magic bullets” that only the elite can afford are not the solution to our healthcare crisis. Be skeptical of any practitioner who claims that food is irrelevant, that lifestyle doesn’t matter, that supplements are necessary, or that they’ve got some patented way to cure your disease. Beware of any protocol that costs crazy amounts of money, professionals who aren’t transparent about their approach, or unrealistic-sounding claims masked with pseudoscience or success stories. Of course, a qualified healthcare practitioner isn’t necessarily cheap, and this doesn’t mean that it’s not worth investing in skilled practitioners. Quite the opposite! But, be aware that there are charlatans out there (some well-meaning ones) as well as complete ineptitude. 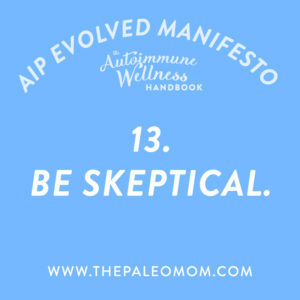 So, integrate your skepticism with Keys #3, #11 and #12. Restoring our health is a worthy pursuit but it is not a religion. Once we discover the healing power of the right foods, sleep, stress management, movement and connection, it’s easy to become a little overzealous and even militant in our approaches. Sustaining these healthy choices for the rest of our lives requires finding balance and enjoying flexibility where we can. A healthy mindset is super important for the long-term success of our healing journeys. And while sharing our success with others is an important way that we can spread the word and inspire others to make healthy changes, it’s important not to let this ramp up to evangelical levels. 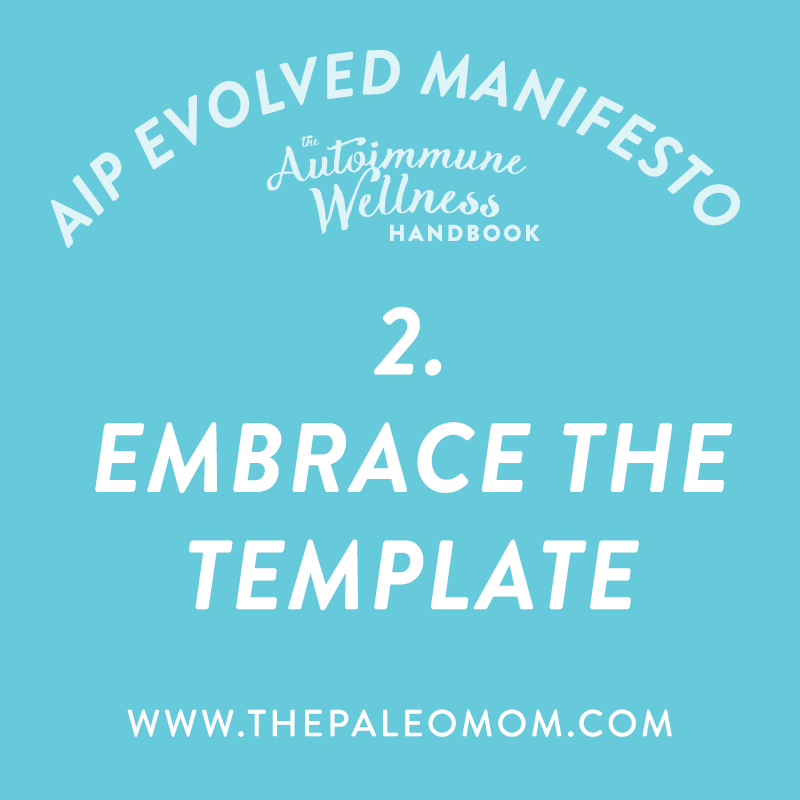 The major reason why I started my website was because I needed an outlet for my enthusiasm and a place to share all of the exciting things that I was learning about the Paleo diet. If your networks aren’t strong enough, explore ways to add to your human connections. 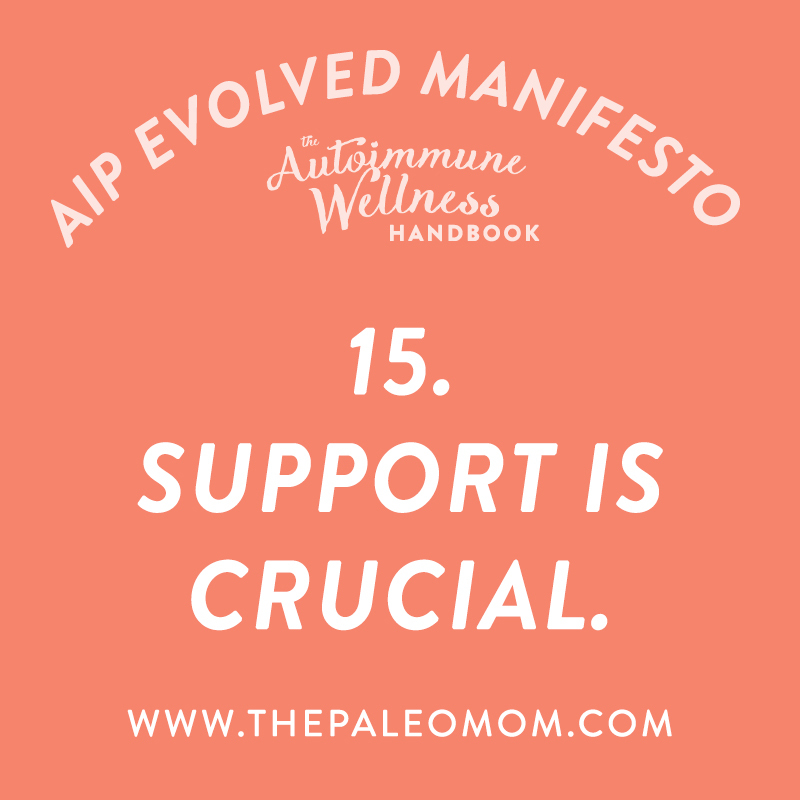 Support is so, so, so important. Human connection by itself is an immune regulator and can promote healing (see The Health Benefits of Connection). But, also the practical aspects of someone to help shop and cook, or take over some household chores, or be an shoulder to cry on, or go out for a hike with, or watch the kids so you can nap, or to just be a cheerleader… just can’t be emphasized enough. So, what do you do if you lack sufficient support? Find it! Whether that takes the form of joining an online community, a local Meet-Up group, taking a class at a local arts or community center, talking with friends and family to communicate your needs, or reconnecting with long-lost friends, your efforts will pay off tenfold. Find areas where your life has been expanded by your experience with illness. Studies of cancer patients show that a positive attitude and sense of hope improves survival rates. Negativity and depression on the other hand has the opposite effect. 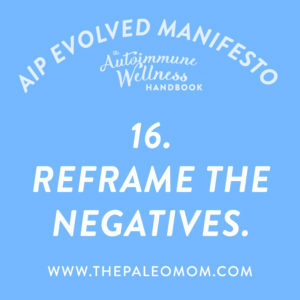 And one major key to finding that positive attitude is to reframe how we think and talk about challenges. I simply wouldn’t be where I am now if it weren’t for my diseases. They colored my life to drive my ambition, determination and work ethic as well as to develop an acute sense of compassion and social consciousness. Pain and fatigue kept me out of trouble as a teenager. Being bullied made me more aware of how to care for and respect others. Struggling with obesity made me appreciate having energy. Experiences with depression, anxiety and adrenal fatigue taught me to seek laughter every day. And all of these things are what led me first to successfully complete my PhD in medical biophysics, to take charge of my own health journey, to launch this website and to write my books. I can’t regret the experiences that made me who I am. Give thought energy to what is good in your life. I am so grateful to my supportive husband, wonderful kids, my amazing team, my family, and my friends. I am grateful for discovering the Paleo community, my functional medicine doctor, and my CrossFit gym. I am grateful for the sunny day outside today, my new kitten, and pumpkins. I’m grateful for you. Practicing gratitude, whether taking a moment to just think about the things we’re grateful for or keeping a gratitude journal, has actually been studied in clinical trials and shown to increase well-being (as measured by mood, coping behaviors, health behaviors, physical symptoms, and overall life appraisals). It’s an important aspect of developing a positive mindset and continued success on our health journeys. 18. Eyes on your own journey. The path to wellness is unique for all of us. Resist the urge to compare. It’s so easy to feel despair when we compare our own health journeys to others around us, especially others who are experiencing more dramatic results. 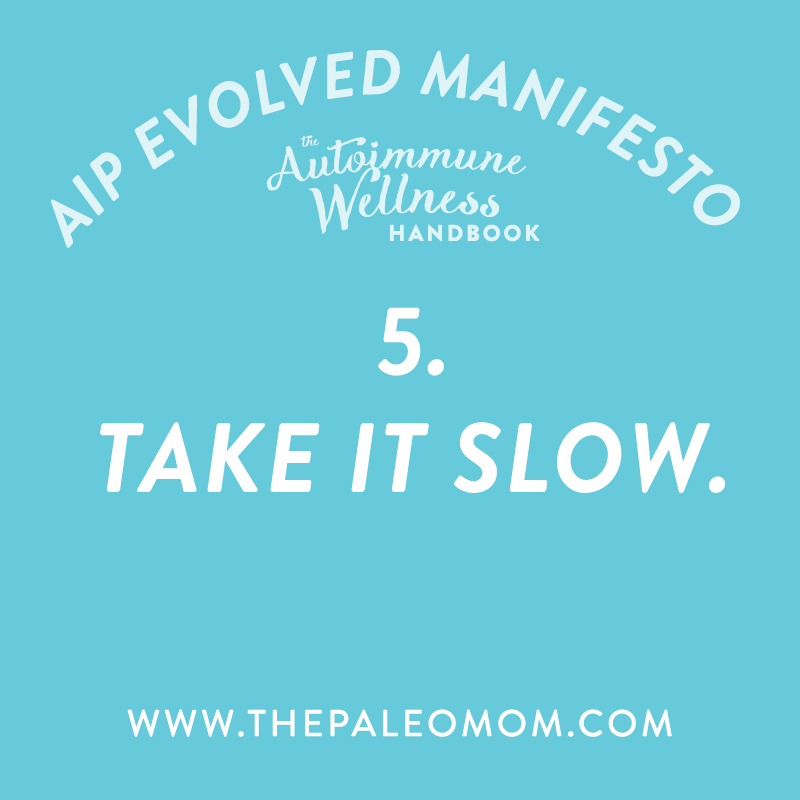 I once received an e-mail from a young man with reactive arthritis who, after a mere 3 days on the Autoimmune Protocol, was able to get out of his wheelchair for the first time in years. 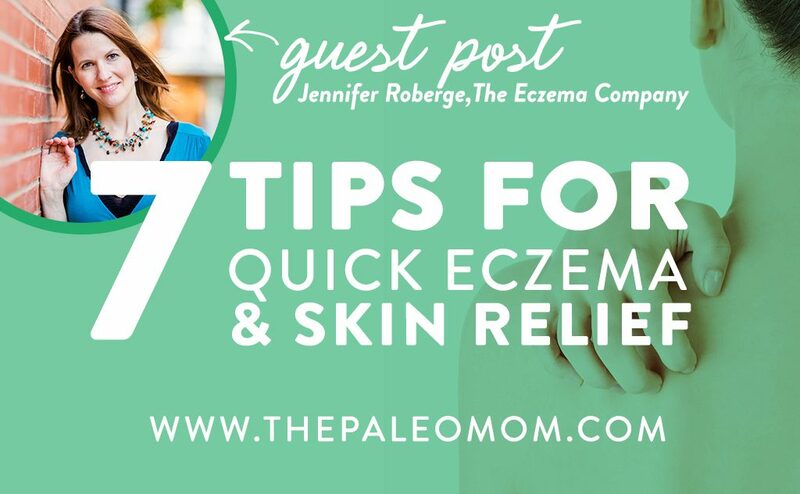 It took me 10 months of following the Autoimmune Protocol to see enough improvement in my skin conditions that I felt like I could try reintroductions. Be happy for those around you, but don’t let their success make you second-guess your plan. Resist jealousy or competitive leanings, and instead go back to Keys #16 and #17. Value wellness above numbers on a scale or reflections in a mirror. This has always been a struggle for me. I’d love to be thinner, but my body is healthy, energetic, fit, and happy at my current weight, what my doctor would probably say is 30 pounds overweight. Fortunately for me, my functional medicine doctor is more focused on other markers of health, which let’s me focus on what’s really important (that part where I’m healthy rather than the number on the scale). 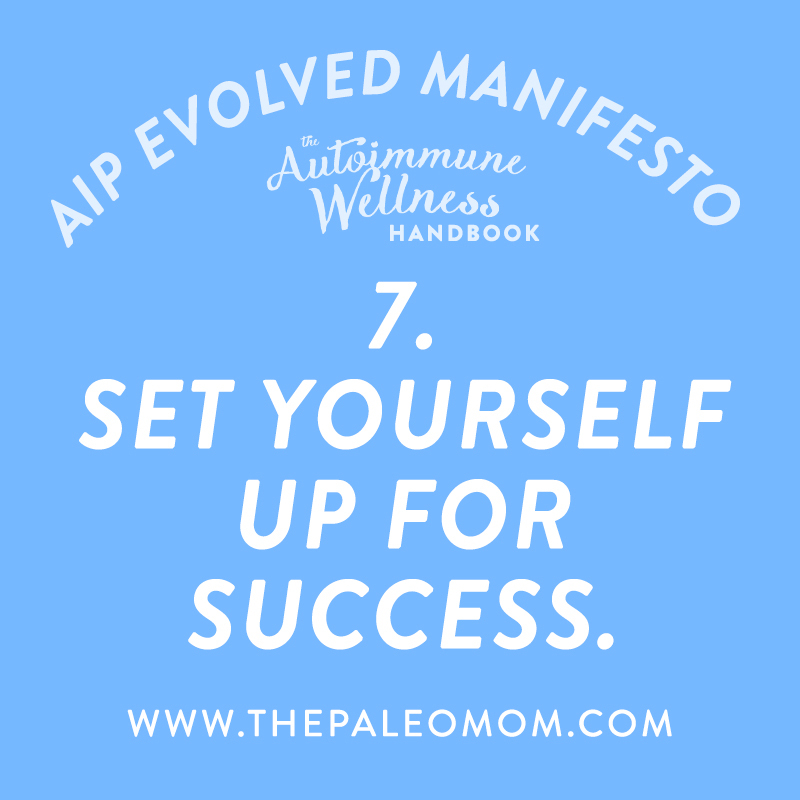 Celebrating our progress means honing in on the metrics of health that really matter, like how we feel, how we sleep, how happy we are, how much energy we have, and test results that have deep implications for our overall health like markers of inflammation. 20. Vibrant health is a lifelong journey. Nobody ever regrets investing in their wellness. Enjoy the process of restoring your health! Whewf! We made it to #20. And, this one shouldn’t be a surprise. 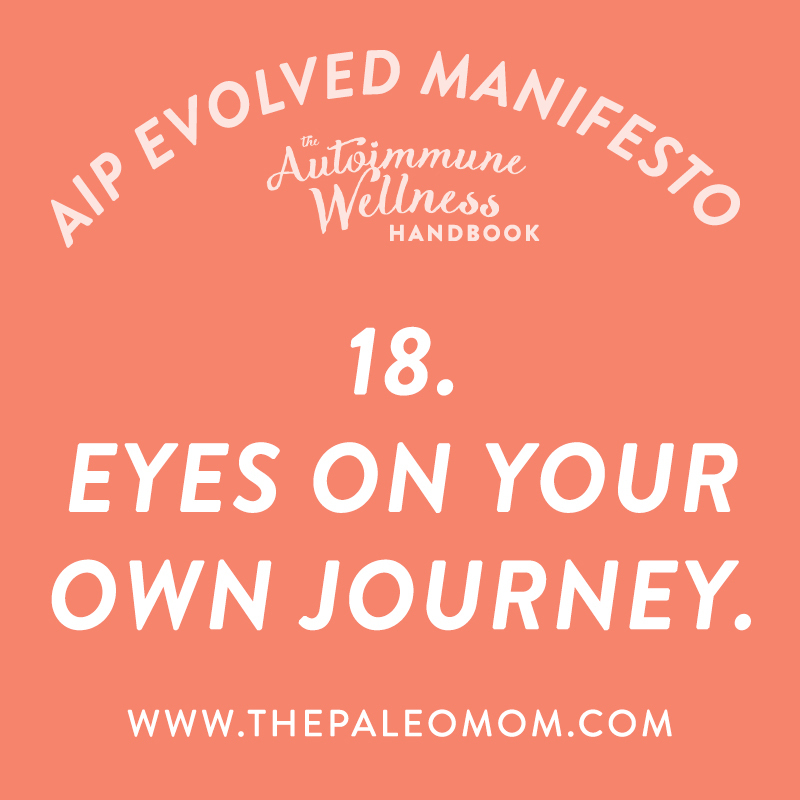 The Autoimmune Protocol is about life-long health, and that means that the journey is never over. We remain dedicated to healthy choices, we continue to tinker and discover, we explore new foods, we find new activities to try, we explore new alternative medicine options, and we understand that health is as much about the journey and the day-to-day choices as it is about the destination. 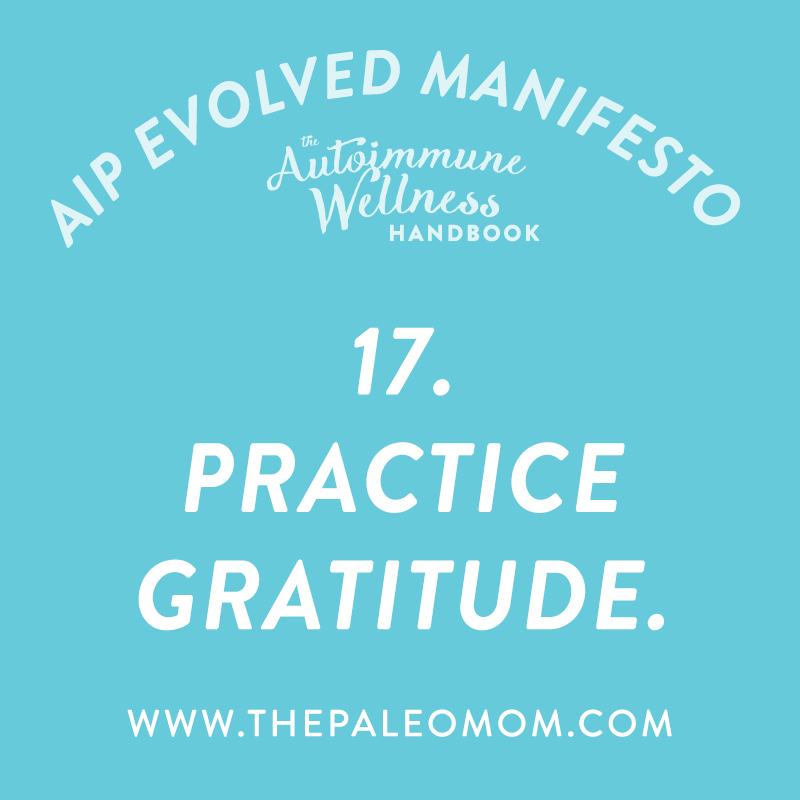 And, when we can find joy and gratitude (yep, Key #17) in the journey itself, we find sustainability, patience, and balance to keep moving forward for the rest of our lives. I can’t emphasize enough how much I respect and love the work that Mickey and Angie are doing. 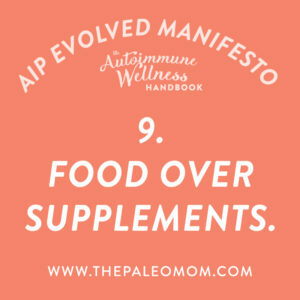 And The Autoimmune Wellness Handbook is just a phenomenal resource! Support them and advance your own journey by ordering this amazing book now! Thank you for offering such great tips. 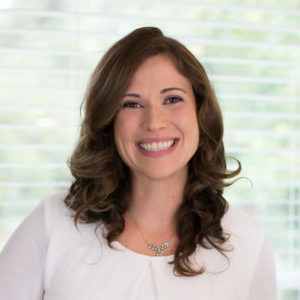 I’ve had Hashimoto’s for 7+ years now and just within the last year or so have moved away from the endocrinologist and over to a naturopathic doctor. 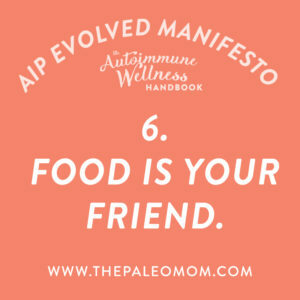 I’ve been eating (most of the time) gluten free but my antibodies are still over 1300, so now I’m exploring AIP/Paleo in the hopes of lowering my antibodies and healing my gut issues. My biggest concern is finding the time to plan and prepare meals as well as having the will power to stick with this new eating plan, but I want to feel better, have more energy and possibly give up the Nexium altogether! My husband and daughter have Hashi’s. 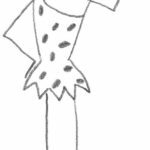 We have found that natural desiccated bovine along with regular Paleo helped immensely. My daughter’s antibodies went down significantly! We haven’t checked my husband’s yet. We use Thyro gold. They have a Q & A section that helps with figuring out a proper dosage. Hope this helps! 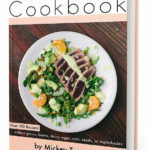 Hi, the link to the 110 recipes above is broken. We’ll get that fixed ASAP. Thanks! Great information, this is only just catching on in NZ and the information certainly needs more media attention to get to the masses. I will now link it to my website also. 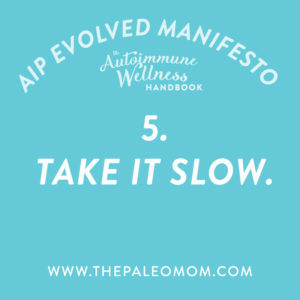 I recommend trying out some of the recipes in my recent post 15 Awesome AIP Snack Ideas! The SAD to AIP link is not working. I have systemic sclerosis which produces too much collagen in my skin and other soft tissues. I’m afraid that putting more collagen in my diet will be counterproductive. Also, I haven’t had any red meat since 1977 and when I do eat it, I’m sick as a dog. Is there a poultry liver alternative? It is understandable that you might be hesitant about collagen. Have you experimented with bad results? Definitely consult with your doctor before making significant dietary changes! I wonder whether it’s doable/viable a vegan/vegetarian AIP? Does it make sense, or is it going too far?